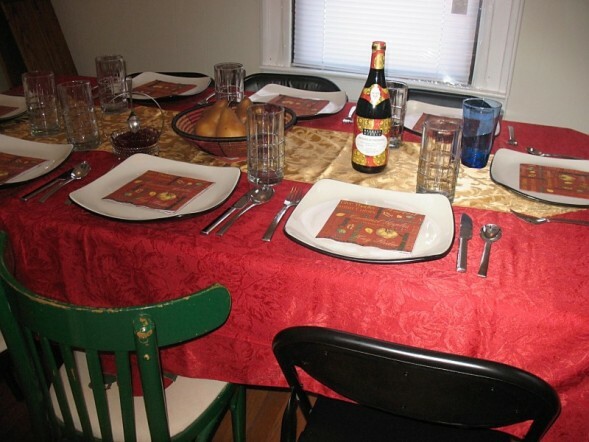 This was my Thanksgiving table. I’m over it. The bird, pie that I threw away so I wouldn’t eat it, the stupid delicious potatoes with their cream cheese, the whole works. But you need to know something about me. I’m not crafty or good at designy things. Sure, I get a random compliment or two on occasional outfits I put together. Dressing myself is one thing. Dressing a room in my house is entirely another. Look, I don’t even own matching chairs. And see how we left the extra table leaves just hanging out in the corner? Yeah, my future-mother-in-law is probably really impressed by me. But there was one thing I was pretty proud of…see it there in the center of the table? It’s a basket with pears. Well, I think it’s a pretty special basket. The fiance’s mother gave the basket to me last Christmas. (Isn’t she sweet?) It’s from Macy’s last year when they did their Path to Peace collection. It was hand-made by a woman in Rwanda . Such beautiful colors. And I thought pears might look kind of lovely in it. Sometimes I really surprise myself. And then sometimes I astound myself. Today I thought, I should make a pear crisp out of those pears. Who is this girl? Pear crisp? I’ve never had a pear crisp in my life. I don’t make pies or cakes or crisps. I make really silly looking turkey cupcakes, maybe but not pear crisps. 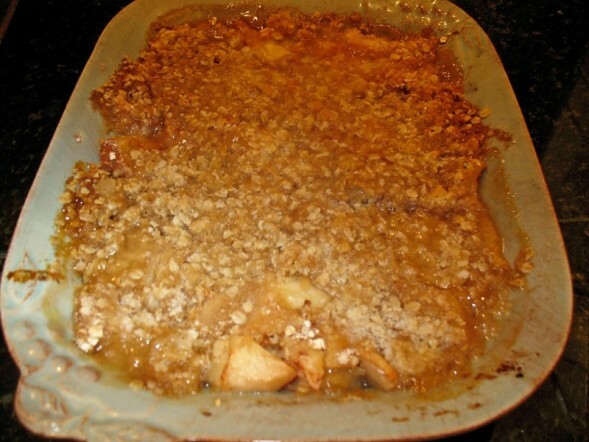 I googled a few recipes and decided that sure, I could make a pear crisp. My mom even e-mailed me a recipe for a crisp she likes. Crisp. What a funny word for a dessert. In England, it would sound like I was making a pear potato chip. I e-mailed my friend Dawn to let her know I had lost it a little. I was turning my Thanksgiving centerpiece into a dessert. She said it was probably fine, but if I started thinking about glue guns then we might have a problem. So tonight, while I was making Jaden Hair’s Wonton Noodle Soup, I was simultaneously peeling pears, and wondering where this domestic diva standing in my kitchen came from. And then I decided to mix some sake with the pears because I’m all infatuated with Jaden’s and her Steamy Kitchen. And that’s what I thought Jaden would do. Toss the pears in the lemon, sugar and cinnamon. Then add the sake and pour into your small baking dish. Mix the brown sugar, flour, butter and oatmeal. Cut the butter into the mix and try to get it as crumbly as possible. (I wasn’t this patient) Top the pears with the oatmeal mix. Bake at 350 for 30 minutes. (Then I decided it needed more butter, so I took it out and put a few pats on top…yum.) Then bake for 20 more minutes (then I took it out and kind of mixed the crumbly bits together into the buttery parts. Look, don’t make fun of my technique. I never claimed this was an act of perfection.) Bake again for 5 more minutes and then…. I was nice enough to snap that picture before I stuck a fork in it. Oh yum…oh wow. This is what a centerpiece tastes like. Ooh..I love pears. Will totally try this! huh, guess I missed the memo to add sake to MY pear crisp last night. The good thing about mine is that dad and Mary aren’t crazy about pears, so I think it’s ALL MINE. In fact, I did a pretty good job last night of claiming it. Okay, I am SUPER impressed. Look at you! AND it was edible???? Was Mom-in-law close enough to get dish of it? Maybe it would have made up for the leaves left out. Lol. 🙂 Excellent job, you recycler, you!